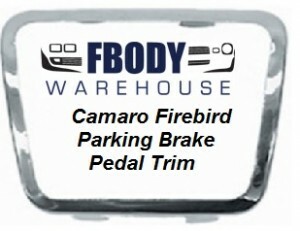 This is a new chrome trim wrap for 1967 - 1968 Camaro Firebird parking brake. This was a deluxe option which had these stainless inlays which wrap onto the pedal pads. Installation takes just a moment at home. This is a new chrome trim wrap for 1967 - 1968 Camaro Firebird parking brake. Correct park brake pedal pad stainless polished trim. GM Group #: 4.630 GM Part # 3893182 Trim will fit all applications although may not be original for the application. Nice addition to brighten up those plain black pedals.